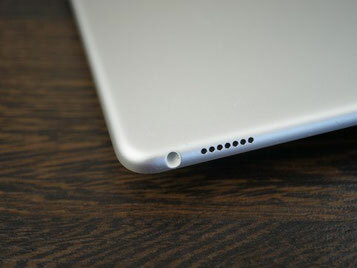 As well as a series of MacBook Pro laptops, Apple iPad Pro line of tablets consists of models with different diagonals. Giant 12.9-inch tablet to carry around as possible, but difficult. But the 9.7-inch version will get universal. 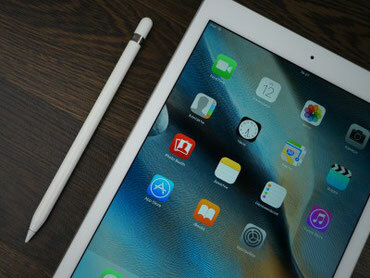 The thin and light device is headed by a series of medium-sized Apple tablet. Download Apple iPhone user guide. 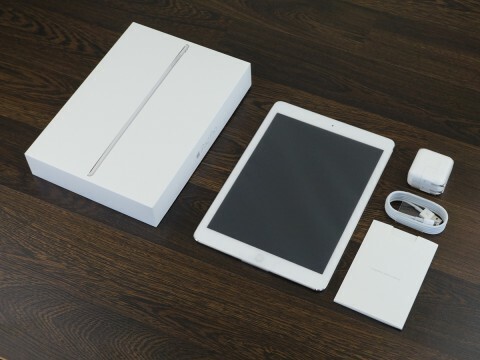 White box with the name of the device and a slim profile iPad Pro on the cover - a concise and recognizable design does not need recommendations immediately clear which manufacturer produced this product. Package minimum: Charging AC Adapter 10 W, capacity 2.1 Ampere, Apple User manual, removable plug for connection to a power outlet and Lightning cable. If you choose a model with LTE, something extra in the box put "clip" for the SIM-card. But the headset for listening to music and talking on FaceTime or Skype will not be in any case. 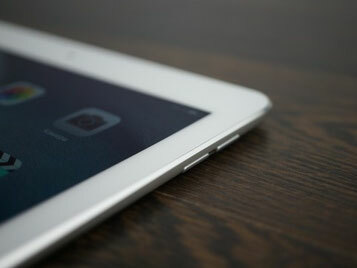 From the Apple figured out how to be a tablet, and the design change is rare. 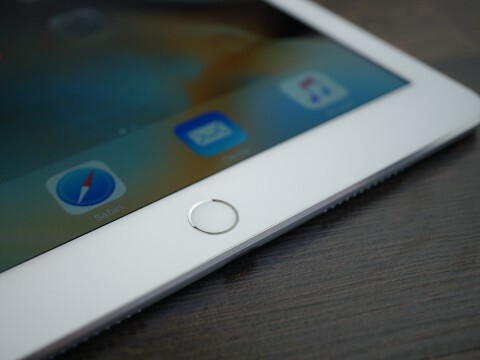 iPad Pro is almost completely copies the previously released iPad Air 2, which in turn inherited traits iPad Air, which was shown as early as the end of 2013. However, this does not prevent the iPad Pro to be one of the prettiest tablets on the market: an elegant body, high-quality manufacturing, light weight and variety of colors. The body is very thin, and find an analogue with the same elegant profile (only 6.1 mm) will be difficult. The structure is made of durable aluminum 7000-series like the iPhone 6s (look review), moreover tablet is not only silver, dark gray or gold, but now also in pink. Girls like it. If the iPad Air 2 suit cases and covers from the simple Air, on the iPad Pro, they have not kept. The Apple changed the arrangement of the magnets, so that the edge of the old boot will constantly hang out, and therefore, will have to buy new "clothes" for display protection. 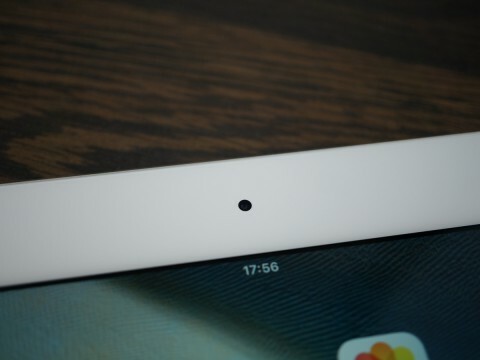 At the iPad Pro, like the iPad Air 2, there is a lever on the side of the famous, who helped block the automatic rotation of the image on the screen or turn on silent mode. Now for these operations need to press the buttons in the menu. Under the screen is a "Home" button with a fingerprint scanner. Volume buttons with clear progress brought to the right side, at the top end - power button and a connector for headphones. At the bottom of the port for the cable and accessories with Lightning support. 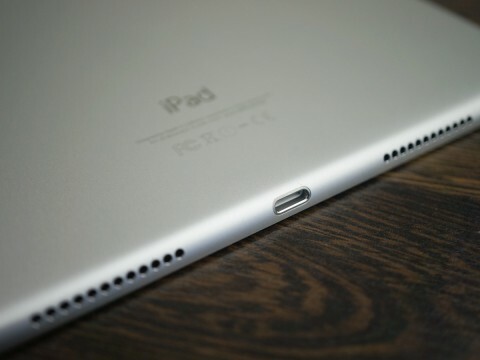 Gratings have iPad Pro speakers are located not only on the bottom, but also at the top end - one of the main differences from the external iPad Air 2. Also, the camera module on the rear surface bulges here and earlier located flush with the housing. 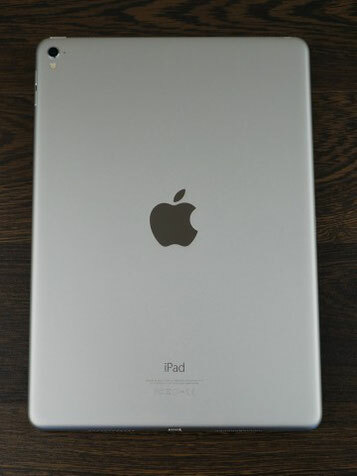 In a class of ten-inch tablet iPad Pro - one of the most thin and light. Due to its light weight it wants to take with you, and not to leave the house to sit back. The most convenient way to take up the gadget in both hands, then there is no fear that the thin aluminum body slips out of his hands. Still, this is not the iPad mini, to watch the video in the subway, holding it in front of him with one hand. 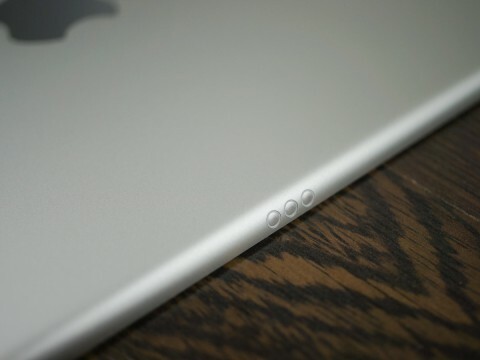 The fingerprint scanner on the plate of the same generation as the iPhone 6, iPhone CE, or iPad Air 2. It works well and accurately - a convenient and easy-to-configure tool for the protection of personal data. If after ten attempts did not succeed to log in, the tablet will automatically erase all data. This option is disabled by default in the settings, it can be included as necessary and not to worry that the child will begin to demand not to break into the device, and all data will be lost by mistake. 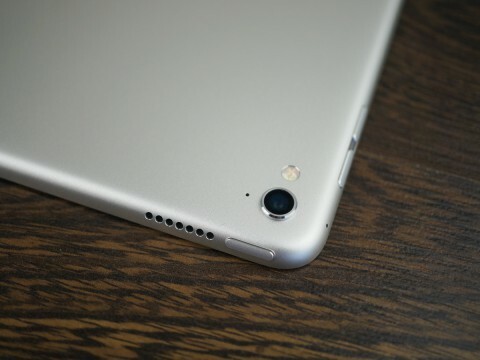 Retina-display has a resolution of the iPad 1536h2048 and density of 264 ppi, as four years ago. No air gap, there is a good cover - and oleophobic anti-reflective, while working under the sun, the tablet does not become a black hole in your hand. Illuminance sensor operates accurately and smoothly, without sharp jumps change the backlight. Calibration and adjustment of colors Apple screens - one of the best on the market, and the iPad Pro's precise and accurate passes palette. The backlighting is even and without glow. When it comes to the evening, the picture becomes warmer, the morning comes - to replace the yellowish image comes cold colors. 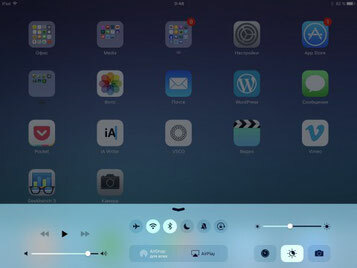 This is how the function Night Shift, which appeared in iOS 9.3 and reduces eye strain. But iPad Pro added more technology True Tone, which during the day automatically adjusts the color temperature using the FaceTime camera. The tablet is running iOS version 9.3.2, the new features we note the following points in this version of the system. Night Shift mode, depending on the time of day and geolocation changes color. The data in the notes no longer read no one but the owner of the tablet, because they can be blocked by a fingerprint scanner. The application "Health", which gets statistics on daily activities and fitness data with bracelets, received a modified interface. Recall of iOS design principles. Applications as they are installed on the desktops are arranged one behind the other, running sorting into folders, but to place the icons in any order can not be, there should be no gaps between them. 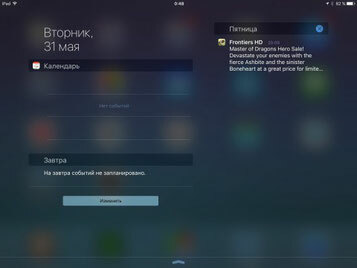 Curtain with notifications shows a plan of action for the day, if there are entries in the calendar or reminders. 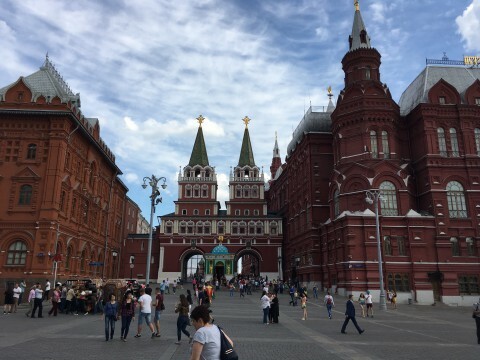 At the same time here and get new messages from social networks. 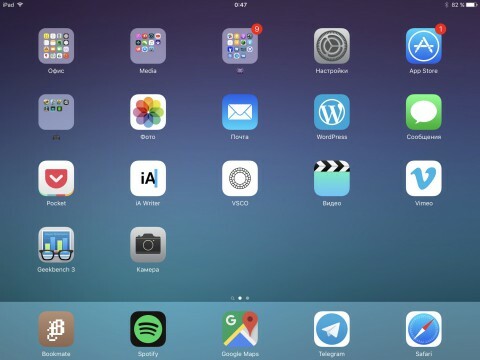 As usual, Apple tablet gets a set of applications that you can not remove. Bottom pulled a menu with shortcuts to quickly access certain functions and settings like lock screen auto rotate and turn off wireless modules. It also operates a music player control, and started the AirPlay, when you want to display an image or sound from the iPad to the Apple TV or compatible device. Powered gesture control, here are some examples. To start putting a finger to the screen four, we do move up and see a menu of running programs, and if you move your fingers left or right - to switch between applications. If you keep your fingers together, then go to the home screen from any application by simulating a click on the button "Home". Slide Over - operation, which can cause a second application in a small window, without leaving the ground, for example, if you watch YouTube, and Twitter simultaneously read. Split View allows you to run two programs simultaneously, without switching between them, dividing the screen into two parts. If you drive with two fingers on the screen, then it is easier to work with the text, highlighting, or moving it. 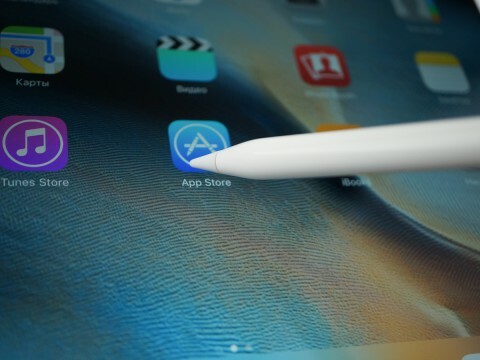 For the iPad at the Apple Pro Series developed a special accessory - Apple Pencil. 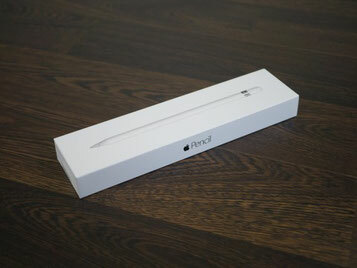 In size it resembles stationery pencil, except that weighs a bit more - after all, the electronic device. Hold it in your hand is convenient, easy to get used to draw on the screen with it. Instant response by clicking on a display - got a point, line, or what they wanted to portray the feeling is the same as on a conventional pencil or pen, only the hands are clean and does not remain traces of ink or lead. The pen determines the strength of pressing (to 2048 levels) and the angle of inclination, so the thin line of easy to make a thick, hatch pattern, or add shadow. 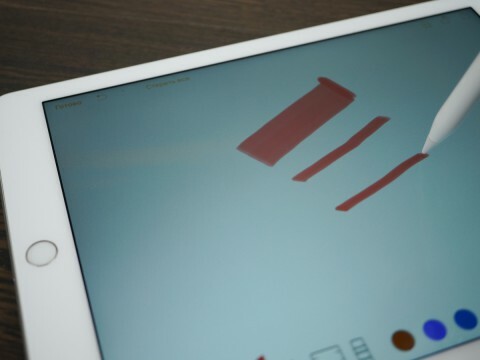 More interesting finding was that if the tablet screen to put a piece of paper and hold it on the Apple Pencil, then the iPad will copy the pattern. 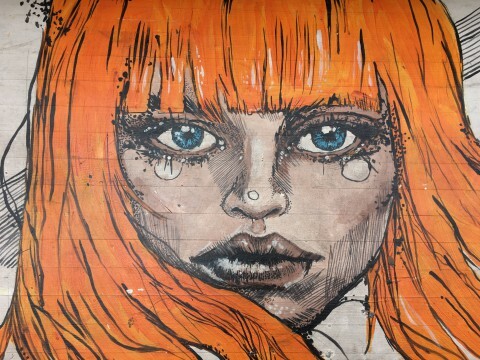 This is a convenient way to boost your artistic skills or start to fill his hand this way. In contrast to the 12.9-inch "brother" this tablet weighs much less, he more mobile and easier to draw in the "field" on it comfortably. And during artistic experiments tablet does not respond to the touch of fingers to the screen, so no extra marks on the figure appears. 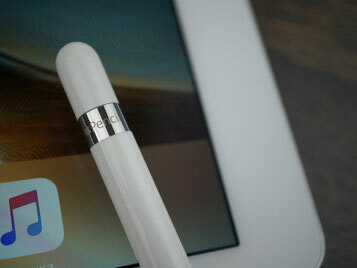 Own the pen battery lasts for 12 hours, and if Apple Pencil lying idle, it will automatically go into power-saving mode. To charge using Lightning-port and can be connected not only to the pen tablet itself, but also to the USB-cable using an adapter from the kit. Apple Pencil works not only as a supplement to the drawing, it can play the role of a small pointer, which you can launch applications, flipping pages in a browser, just move the mouse. Accessory perform all the actions that we used to do with your finger, and in some cases, for example, when you select-copy-paste the text is simply irreplaceable thing. Built-in memory to choose from: 32, 128 or 256 GB. Alas, practical version of 64 GB is no more. 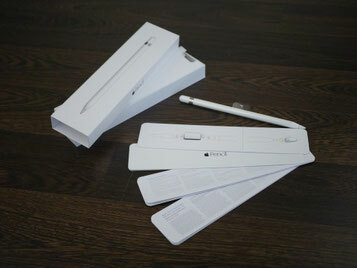 The gadget, which ended up in the version of 32 GB to 25 GB was available. Given the fact that the beautiful game "weighs" about 2 GB, and one minute of 4K video - approximately 300 MB, the memory when selecting better not to save, otherwise will have to constantly upload the data to a computer or to throw in the "cloud". 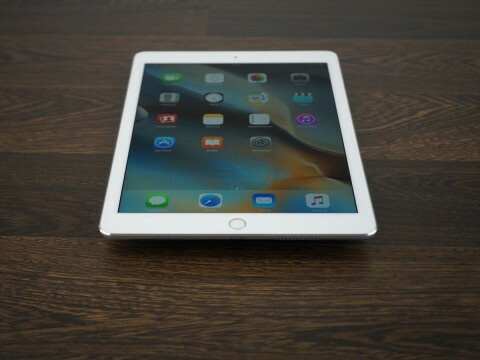 On board the iPad Pro 2 GB of "RAM" and a processor Apple A9X company coprocessor M9. 2 GB of RAM is enough for any task, and the difference compared with the same Apple tablet with 1 GB of RAM - impressive. 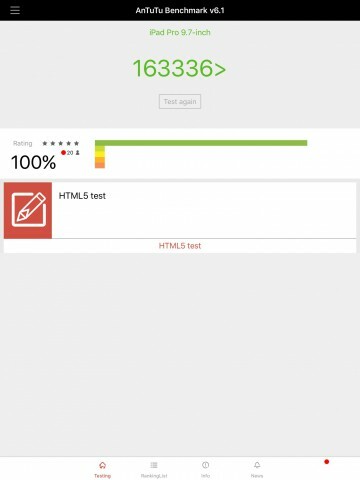 Much faster scrolling of pages in the browser and change the orientation, do not restart the application in the background, you can switch between them quickly. So if you buy a tablet with an eye to the active work, the iPad Pro is the smart choice. It is powerful and easy to cope with two dozen tabs in the browser, demanding games and editing processes such as 4K video in iMovie. The benchmarks tablet gives pleasing to look beautiful boom figures. Aspect Ratio 4: 3 was the original Apple «chip». This format is ideal for reading books or websites, but watch comes with big stripes on the screen. Even if you take movies on iTunes service will remain empty seats. It is possible to "cut" the image by removing the strip, but the cost of the frame parts on the left and right. The speakers are very loud and high-quality, thin tablet plays music loud unexpectedly. He has a large margin of volume, voice games or movies audio track impressive tablet copes well with its task, replacing a separate column. Tablet copes with all games, the standard test suite application worked flawlessly. Apple has never paid much attention to the camera in the iPad, but with the advent of the 9.7-inch Pro has changed. 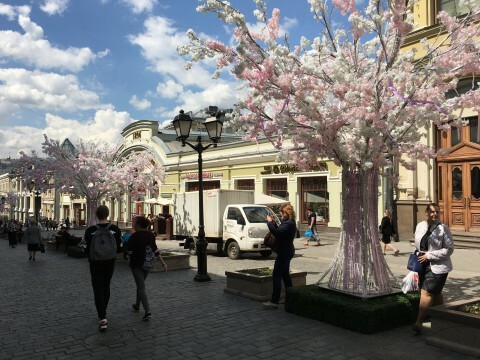 There is a module on the 12 megapixel, as in the new iPhone 6s and iPhone SE. At the same time added to the plate and the two-color flash - another rarity in the world of tablets. Fit module is flush with the thin body could not, he is above the surface. Camera iSight - with a small number of settings, there is the HDR, photography Live Photo, panoramic mode, face detection, video recording in slow-motion and timelaps. Tablet writes video to 4K, the maximum resolution at 30 frames per second can be recorded in either a space-saving: 1080p 60 or 30 frames. Camera application can be launched via the lock screen or by clicking on the icon in the menu. After a couple of seconds after this action you're done, you can take pictures. The front facing camera to 5 megapixels - only in tablets and Apple smartphones with high-quality module for selfi. 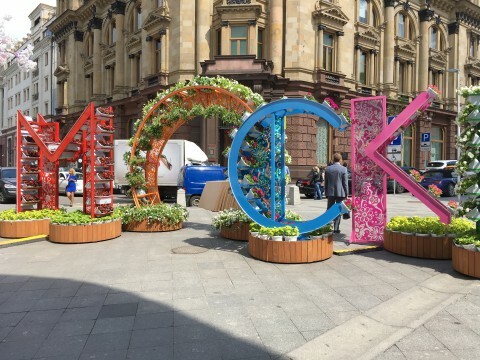 These are obtained by the images taken on the street. iPad Pro in our test version only works with Wi-Fi networks in the 2.4 and 5 GHz. Connecting a stable, high speed data transfer. Bluetooth version 4.2 is required for connecting accessories such as a keyboard or Apple Pencil, not to mention the headphones or drone. If you buy the version with the nano-SIM, which the manufacturer calls «Wi-Fi + Cellular», we get the data transmission function in cellular networks. The tablet works with all frequency ranges, so that the iPad Pro on a business trip or on vacation accurately provide internet. Another advantage of the version with SIM-card - support for GLONASS and A-GPS, which is not the cheaper Wi-Fi version. Therefore, if the tablet is scheduled to take on the role of navigator, you need to pay extra for a slot for "Sims." Also in the present iPad Pro Smart Connector port on the left side, which is used for connecting accessories such as covers or keyboards. In the future, you may receive the docking station to charge the device. Tablets Apple iPad famous work time, that iPad Pro does not disappoint. Battery Capacity 27.3 Wh, which according to Apple is enough for 10 hours of work. 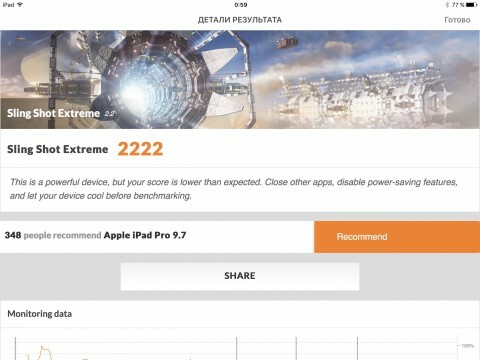 In some games, for example, Heroes III, tablet sits at 20% per hour in less demanding toys like Dead Trigger 2 for this time it is discharged less than 10%. The tablet plays video FHD-as 10 hours on maximum brightness without stopping. Mixed Operation times vary depending on the load: if the device is at home in the evening and 2-3 hours entertaining reading, watching videos, or websites, then it will have to charge no more than twice a week. 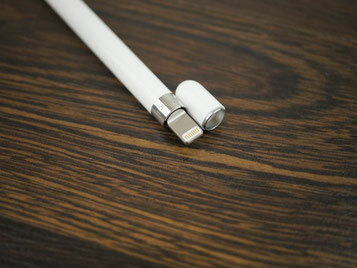 For the charging cable is required with the lightning-socket, you can charge the tablet from the computer USB-ports, or network device. Includes power adapter to 2.1 Am. 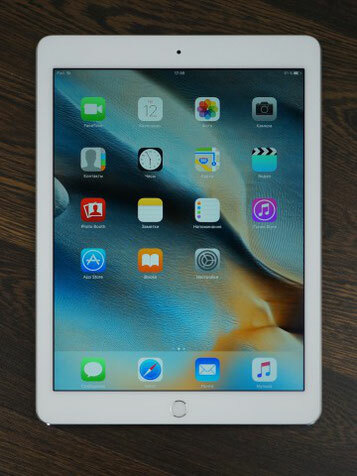 Apple iPad Pro 9,7 - plate in all respects attractive. For an elegant and beautiful body hides a top stuffing, headroom that will be enough for a few more major iOS updates.